Councillor Cathy Casey is on a mission to make Auckland climb the ranks as a dog-friendly city. As part of that charge, she’s been on the hunt for cafes and restaurants where the furry members of her family are allowed to join her. “A big factor of what makes a dog-friendly city is being able to take your dogs out to places where you go, so I’m on the hunt for dog-friendly eating spots!” Councillor Casey says. “I took the dogs on the Te Atatū Coastal Walkway recently. 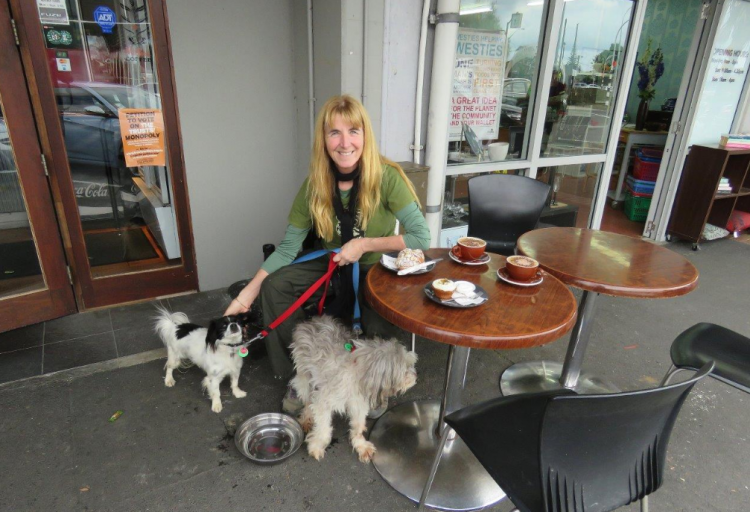 After three hours in the open air, it was so nice for myself and my wee pooches be welcomed to sit outside in a local café in Te Atatū. They got their bowl of water and I got my coffee and cake and we all enjoyed having a rest and watching the world go by. Well done Fuze Café! Since the Food Act of 2014 came into action two years ago, registered businesses can choose to let dogs into customer dining areas, as long as they manage risks the dogs pose to food safety – for example making sure any food on display is protected from contamination. Lots of cafes and bars across Auckland are now making their outdoor seating area available to dogs. For all the Suzie and Pats out there, The Urban List recently did an article on Auckland’s Best Dog Friendly Cafes. Similarly, Dogs Welcome NZ has a list of places to take your dog to eat all over New Zealand. We’ve picked out a few of them in different parts of the city. (If you do visit – make sure you check to see if dogs are allowed inside or just the outside dining area). If you’re up north, check out Zomer in Takapuna. Recommended by both The Urban List and Dogs Welcome NZ, word on the street is that there are plenty of dog bowls to keep your thirsty dogs happy. For those heading westwards, stop by Woodworks Café in Avondale. Perfect for a relaxing morning out. When you’re in the central city and your pooch needs a break, stop by Best Ugly Bagel or Brothers Beer – both in the City Works Depot. See what your dog prefers; are they a tasty bagel or a good ale sort? If you’re south of the city centre don’t miss Cornwall Park Café – another one recommended by both the Urban List and Dogs Welcome NZ. To really get your doggo's tail wagging, enjoy a good, long walk in the park and finish up here for a bite to eat. For all you folks out east, hit up the Kohi Beach Café – good view, good dog and good food. What more could you want? Meanwhile, if you and your dog are taking a trip out of the city, try out Leigh Sawmill! According to The Urban List their pizza is particularly unmissable! Meanwhile, in other Auckland dog news: Auckland Council has voted to support dogs being allowed to travel on public transport and is awaiting the rules for carriage from Auckland Transport. Councillor Casey is hoping that owners will be allowed to assess the best way to transport their pooch safely. The council has also voted to support on-leash dog access to the new SkyPath across Auckland Harbour Bridge.